By uploading your photograph(s), images and/or video(s) (collectively “User Content”) on our website, or through our Curalate Share Platform or by responding #yes or yes to our request to use your User Content, you agree and grant TechStyle Inc., (d/b/a JustFab) and its subsidiaries including but not limited to ShoeDazzle.com, Inc., Fabletics LLC, Lavender Lingerie, LLC (d/b/a Savage X Fenty), Personal Retailing, Inc. (d/b/a FabKids) and its parents, agents, employees, successors, affiliates, and /or related entities ( collectively herein “TechStyle”) an absolute unrestricted, non-exclusive, royalty-free, irrevocable, worldwide, perpetual, and transferable license to use, store, reproduce, copy, distribute, publish, copyright, broadcast, display, combine with other materials, edit, alter and/or modify your User Content along with your name, handle, likeness in any and all forms of media, including but not limited to its webpages, social media platforms, third party websites or materials, digital and physical owned channels and any and all mediums for all promotional, marketing, advertising, promotion and sale of TechStyle products, and any other commercial usages without any consideration or compensation due to you. TechStyle may use, reproduce, distribute, combine with other materials, alter and/or edit your User Content in any manner in its sole discretion, without any obligation or additional permission from you. You represent and warrant to TechStyle that (i) you are over the age of 18, (ii) have the requisite right to transmit, distribute, replicate, and post the User Content, (iii) you are the copyright owner or have the copyright owner's permission required to grant the rights to the User Content provided herein, (iv) you hold the rights necessary to grant the licenses described herein, (v) you have obtained the consent of each person, if any, depicted in the User Content, (vi) you are the parent or legal guardian of each child under the age of 13, if any, depicted in the User Content, (vii) the User Content, and TechStyle's use of the User Content as permitted under these terms and conditions, do not and will not violate, misappropriate or infringe any intellectual property rights, publicity rights or other proprietary rights of any third party, and (viii) you will comply with the Federal Trade Commission guidelines on testimonials and endorsements. You agree to forever release, discharge, indemnify, defend, and hold harmless TechStyle from and against, and covenant not to sue for, any claims, actions, losses, liabilities, expenses, damages and costs, including reasonable attorneys' fees, including but not limited to any claims for defamation or infringement of publicity, privacy or “moral” rights arising from or in connection with the distribution, display and/or use of the User Content, or arising out of or related to any breach of any of the above representations and warranties. You expressly and unconditionally release TechStyle from any claims, damages, actions, or liabilities arising from TechStyle's use of the User Content as permitted herein. 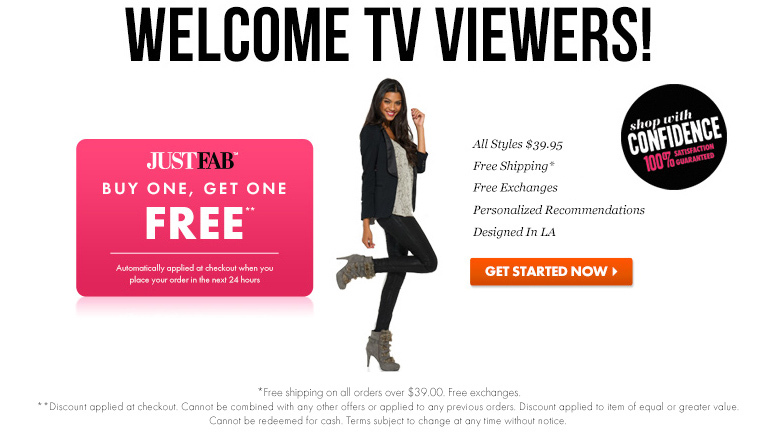 If at any time you believe that any of the representations and warranties provided above is not correct, you must notify us immediately by sending an email to justfabstyle@justfab.com and identifying the User Content along with a detailed explanation of the issue. You understand and acknowledge that this release shall be governed by and interpreted under the laws of the State of California, without regard to its conflict of laws rules. The courts of Los Angeles County shall have exclusive jurisdiction over any and all claims in connection with this release.